The announcement of Carousel by Dropbox presents a new and interesting option for viewing your complete photo history stored on a Mac, iOS, and Android devices. If you're already a Dropbox user, this new capability is particularly intriguing. What Carousel does is create a more practical interface for viewing and sharing Dropbox-stored images. It creates a chronological stream of thumbnails that you can browse by swiping up and down on the iPhone screen, or by swiping left and right on the timeline scale at the bottom of the interface. This sounds simple, but it actually works very well. Photos are presented as collections with location and date as their title. Up to eleven thumbnails from the collection are initially displayed. If there are more pictures in that collection, a number is shown that you can tap on to reveal the remaining photos. When you first log in to Carousel with your Dropbox account information, the app integrates all the photos it can find in your existing Dropbox account with those currently in the iPhone's Camera Roll. Additionally, if you're using Dropbox to automatically archive your iPhoto library, those images become part of your Carousel as well. In a short period of time, the bulk of your photo history is available on the iPhone with very little effort on your behalf. Moving forward, the Carousel is automatically updating itself via these sources. From that point, you can easily view your collection, or share via email, Twitter, and Facebook, or open in an app for editing. Images that you want to retain, but don't want visible in the scrolling Carousel, can be hidden from the stream and viewed only through an option in the Settings menu. Using Carousel will require ample storage on your Dropbox account, but frees up space on your mobile device. If you have available space on Dropbox, this is a solution worth considering. Of course, you can always purchase more if necessary. Currently, Carousel is not compatible with the iPad, and is an iPhone and Android app only. I'll keep you posted as this service evolves. Carousel has a high Nimbleosity Rating. What does that mean? You can learn about Nimbleosity and more by visiting TheNimblePhotographer.com. We take a lot of pictures with our smartphones. But product photography? Yes you can, and I'll prove it. This quest started when I learned about Foldio through a Kickstarter initiative. I ponied up $45 (Kickstarter early adopter price) and received a foldable, portable studio, two LED light strips, and four sweep backdrops. I can fold up the studio, lights, two batteries and one backdrop and fit it in an 11" x 11" carry bag. And with this little studio, I can take some pretty good shots. The Foldio studio in action. One LED light strip on top, and another at the base. Foldio will fit in any messenger bag that can accommodate a laptop. I can set it up in minutes thanks to the magnets that click everything into place. I have one LED light strip adhered to the inside top of the studio, and the other is free floating so I can position it as needed. Because the LED lights are color balanced, you can use auto white balance on your phone or camera, and the rendering should be pretty accurate. 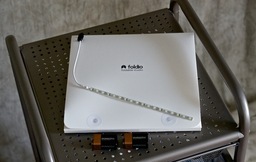 I photographed two different products with the Foldio. One item was shot with the iPhone 5S and Camera+. 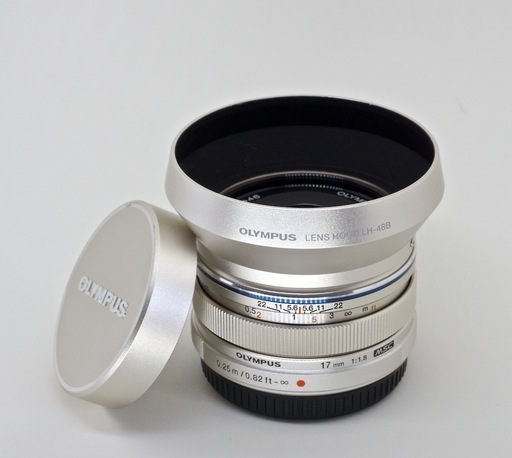 The other item was photographed with a Pentax K-5 and 50mm f/1.8 lens. Can you tell which is which below? Product shot #1 captured in the Foldio using the two LED light strips. Product shot #2 captured in the Foldio using the two LED light strips. If you really want to know right now, you can download one of the images and look at the EXIF data. Otherwise, I'll post the answer tomorrow on the TDS Facebook page. 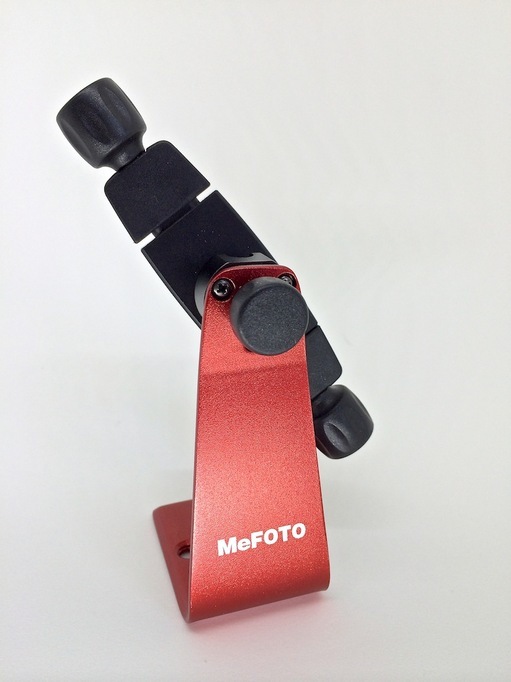 The point is, you can create some lovely product shots with very simple tools. The folks at Foldio will open their store soon. You can get on their mailing list and be notified once they're selling kits. It's a nifty setup that's fun, easy to use, and produces good results. The Foldio has a high Nimbleosity Rating. What does that mean? You can learn about Nimbleosity and more by visiting TheNimblePhotographer.com. Lightroom 5.4 is required to sync with Mobile Lightroom on the iPad. But there's a lot more to this release than that. For starters, the update adds Raw support for 18 new cameras, including the Olympus OM-D E-M10, Canon PowerShot G1 X Mark II, Fujifilm X-T1, Nikon D4S, and the Samsung NX30... just a name a few. For those of us shooting with the E-M10, Lightroom 5.4 is the first mainstream photo management app to support this camera. Olympus E-M10 Raw files decoded in Lightroom 5.4. But there's more. Fujifilm shooters will appreciate the new Camera Matching Color Profiles (PROVIA/STANDARD, Velvia/VIVID, ASTIA/SOFT, MONOCHROME, etc.) for basically all of their current releases. Being able to apply these profiles in post is a nice convenience. 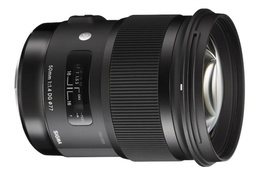 There's also a bucket full of new lens profiles, such as the Canon EF 200-400mm f/4 L IS USM, Sigma 24-105mm f/4 DG OS HSM, GoPro Hero3+ Black Edition, Zeiss Otus 1.4/55 ZF.2, and even the Apple 5c. Again, just to name a few. 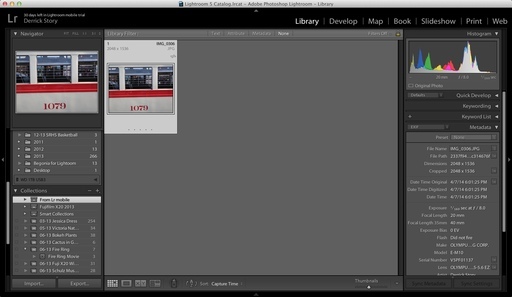 Add in the bug fixes, and this is a major release of Lightroom from Adobe. Practically something for everyone. 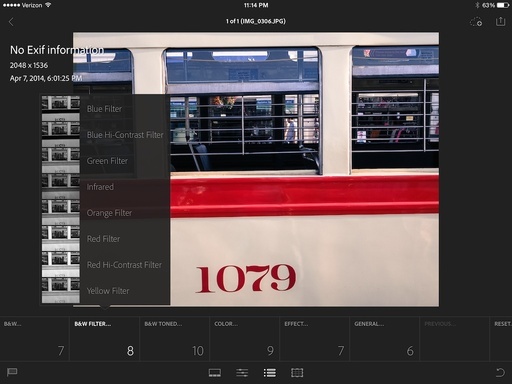 Lightroom is now available for the iPad. You can download the app from the iTunes Store for free, upgrade your existing desktop version of Lightroom to 5.4, then share Collections across devices... for 30 days. After that, you'll need a Creative Cloud account to maintain functionality. On first impression, the tools and user interface for Lightroom Mobile seem useful and well thought out. There are a number of editing tools and filters. 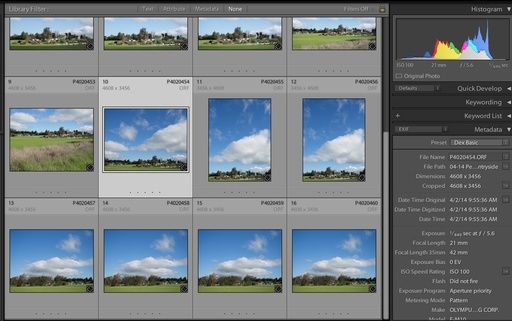 And when synced with desktop Lightroom, you have lots of flexibility when on the go. Pocketlint has published a good article about the specifics. Synced file in Lightroom 5.4 for the Mac. Since Creative Cloud for Photographers is still on sale for $9.99 a month, this mobile version of Lightroom might be just the thing to encourage current fence-sitters to make the jump. I follow up after a bit more testing. The Eye-Fi Mobi is already one of my favorite WiFi-enabled memory cards. With the recent addition of Desktop Receiver, it's become even more interesting. Versions of the beta software are available for both Mac and Windows platforms. When enabled, you computer goes into "listening mode," on the lookout for images available from the Mobi card. If you take a picture, the file is transferred to a folder. In my tests with the Fujifilm X20 compact, which doesn't have built-in WiFi, the process worked smoothly. I shot Raw+Jpeg. 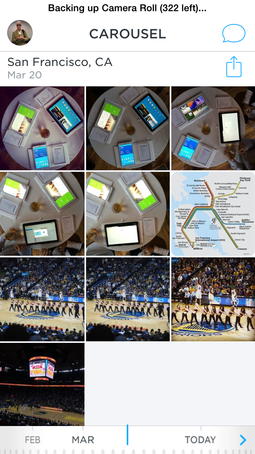 The Jpegs were copied to my Mac and the Raws remained intact in the camera. One thing to keep in mind about the beta software: if you also use the Mobi card to send images to your mobile device, be sure to exit the software on your computer first. My experience was that the iPad couldn't recognize the Mobi when Desktop Receiver was active. You can download the beta software for free from the Eye-Fi Labs site. There's also a handy FAQ there that handles the most common questions. For me, this capability will be handy for blogging. I can shoot a subject and have it appear immediately on my computer for posting. What about you? 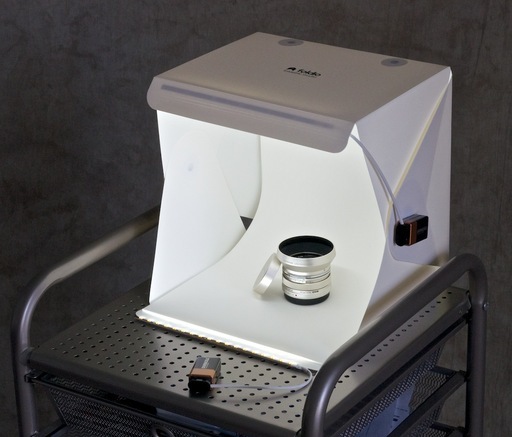 If you have an Eye-Fi Mobi, give this software a spin and see where it takes you. I carry the Fujifilm X-20 compact in my camera bag, set to RAW+Jpeg with the Film Simulation mode on B&W with yellow filter. Why? By doing so, I'm always set to shoot B&W. The monochrome images look great on the LCD when I frame the shot, and while reviewing the images too. 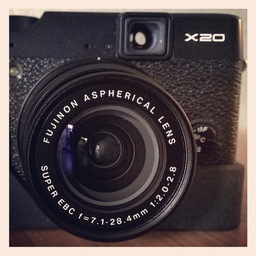 I use the X-20 for this because Fujifilm really has film simulation down to a science. As a safety net, I'm capturing Raw too. When I import the images into Aperture, I enable Raw+Jpeg Pairs (in the import dialog box), then select: "Both (Separate Originals)." By doing so, I get all of those wonderful monochrome Jpegs plus the master Raw files. I tend to separate them into their respective albums. I typically use the B&Ws going forward. But if I need those Raw files, it's good to have 'em.